A new aircraft being introduced into service you say? 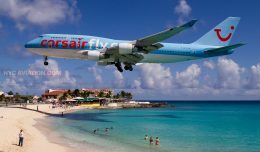 Sounds like the perfect place for over a hundred die hard avgeeks and American Airlines frequent fliers to meet. Nearly seven years after ordering, Thursday May 7 was American Airlines’ inaugural flight of the Boeing 787-8 Dreamliner. Many of us in early February obsessed over which flight would be crowned the first flight. It was leaked on a popular travel forum that flight 2320 would do the honor, despite the seat map still showing an MD-80. Still, many of us booked; business class sold out within hours. N801AC, the second Dreamliner delivered to American on February 28, would be our bird on this inaugural flight. The party started well before dawn with many of us arriving at the gate just after 5 AM for pre-departure drinks and snacks at the gate provided by American Airlines. DFW airport set up a greenscreen with a complimentary 4×6 photo and frame with our bodies superimposed in front of AA’s 787. 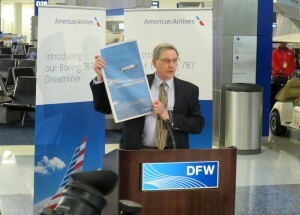 A ceremony prior to boarding featured American Airlines, Boeing and DFW Airport officials expressing their excitement to introduce this new plane to their customers. Boarding would commence at 6:40 and we were handed an AA ‘swag bag’ as we boarded. The bags included a small ‘Welcome aboard our inaugural Boeing 787 Dreamliner flight’ card, portable phone charger, ear buds, snacks and an inaugural AA 787 commemorative coin. Before pushback, several announcements were made welcoming us onboard their new aircraft and wished us a pleasant flight. Common with any special event in the aviation industry, we were greeted with a water salute on departure, although us passengers on the port side of the aircraft only received a distant squirt (it’s ok DFW ARFF, we all got a good chuckle out of it). At 7:30 AM, N801AC and its quiet General Electric GEnX engines spooled up and we rocketed out of DFW on our way to ORD. 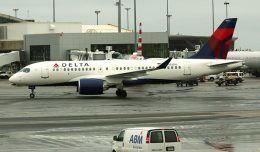 The flight attendants managed to execute their drink service despite dozens of enthusiasts checking out the new plane. 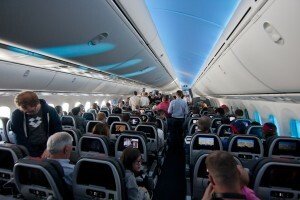 The first thing I found fascinating about the 787 were the electro-chromatic dimmable windows. While there is no actual shade to pull down, it does a good job of darkening the window. The change between dark to bright is so subtle you can’t really see it transition. 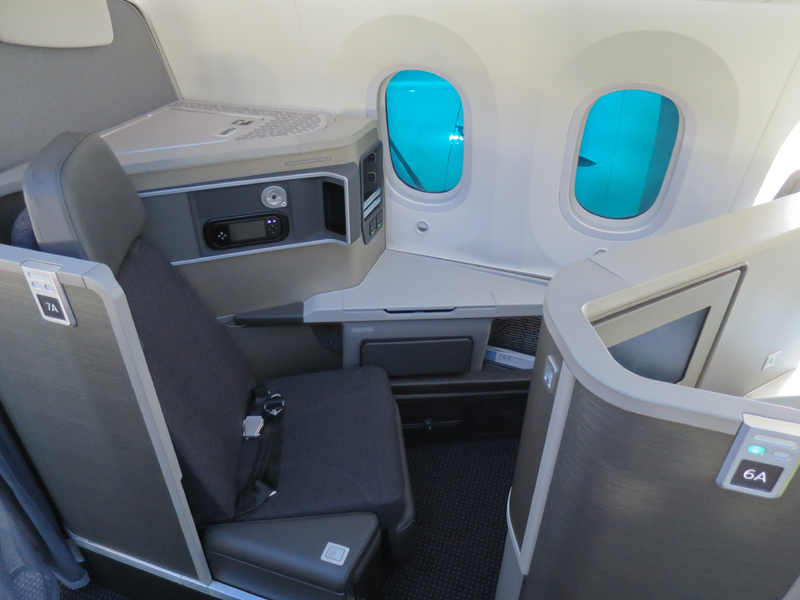 Business class features 28 fully lie-flat 77-inch beds in a 1-2-1 configuration. Each seat is equipped with in-seat personal entertainment with a 16″ HD Panasonic touchscreen monitor. There is a mini bar in the galley behind business class which will provide self-service drinks and snacks on international flights for those seated in the premium cabin. The coach cabin has 48 main cabin extra seats with a 36″ seat pitch and 150 standard main cabin seats at a 31″ pitch all in a 3-3-3 layout. 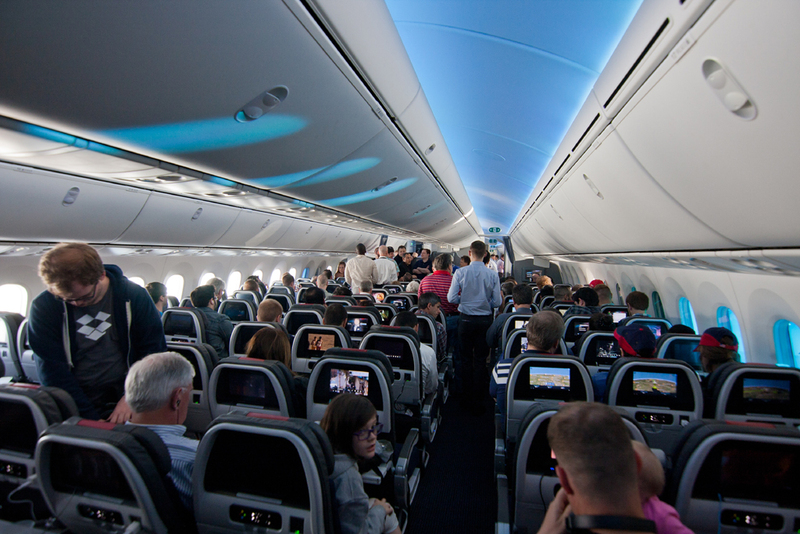 Each seat in the main cabin is equipped with a nine-inch HD Panasonic touchscreen monitor which offers 250 movies, over 180 television programs and more than 350 audio selections. Each seat is also conveniently equipped with universal AC power outlets and a USB jack. 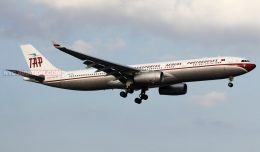 The aircraft also includes high speed WiFi for a fee. After an hour of photos and leisurely mingling with other enthusiasts we began descent into Chicago O’Hare and touched down at 9:23 AM. I can only assume since I was one of the last passengers off that we were onboard a good hour after arrival. We were allowed to run rampant and take photos and visit the cockpit for photos. Neither the cabin nor cleaning crews rushed us which was much appreciated due to the special occasion. Gate L10 in O’Hare was decorated with balloons, drinks and popcorn for passengers onboard the returning leg to DFW as AA 2334. Flight 2334 was showered with another water salute after pushback out of ORD. 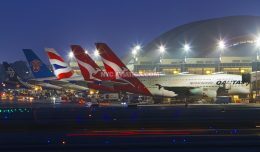 Luckily for anyone wanting to fly on it domestically, there is still time. 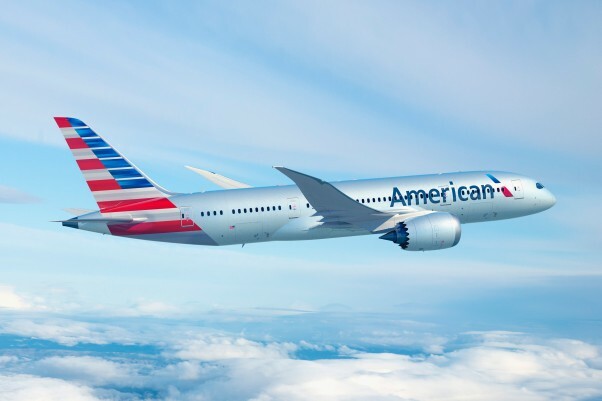 American plans to operate the 787-8 between Dallas and Chicago until June 1 when the aircraft will transition to EZE and PEK on international routes on June 2. American has 42 787s on order with the options for 58 more. 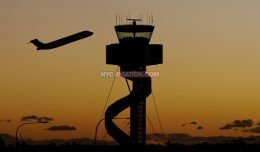 Justin Cederholm is an aviation enthusiast and photographer based in Orlando, FL.